Historic Buildings in America: What Qualifies as Historic and What Place Do Historic Buildings Have in a Modern World? The idea for my senior thesis came to me in stages. The first thing I was sure of was that I wanted my senior thesis, generally, to be about the vibrancy of towns and cityscapes in the United States. This was because I had noticed in my travels abroad that European cities tended to have much more lively and active city centers, especially when comparing the smaller towns and cities. It was while I was pondering the difference between cities on the two continents that I first began to consider historic city centers and their impact on the lives of the city’s inhabitants. As I was considering this in turn, I began to challenge my original conception that it was because European city centers were historic (and therefore more desirable for tourists and residents) and American city centers were not (and therefore unappealing to tourists and residents) that European cities are more alive than American ones. I began to consider, instead, how historic many American cities are and how many buildings within them are at least a 150 years old (c. 1860), with several sections even older. Many European city centers are no older, especially those which were largely rebuilt in the Baroque or Imperial style. And this rumination, in turn, led me to wonder actually what determines what is historic. Are such determinations based on simply age, or do they also involve associations, significance, architecture, rarity, and potentially even public perception of worth? The question fascinated me, and led me to my thesis topic. I suppose the reason I found the topic so interesting is because I am a great lover of history and especially historic buildings. The times I have spent exploring the historic cities of Europe are among the happiest of my life, and I have striven to find cities in America that are similarly historic. I have found them, but they do not possess the same historic atmosphere as the European ones, for the simple reason that the American tourism network does not promote historic city-centers in the same way such networks do in Europe, and the historic neighborhoods are not usually places of tourism but sections of private residences, completely devoid of commercial life. We have our own unique architectural vernacular, but for some reason ours does not seem to have the same fame as the European one. I would greatly like it if we, as Americans, grew more proud of our architectural and historical heritage. I think an important step toward this goal is showing people the depth of history we possess in America. Researching my thesis has provided answers as to how buildings in America can be considered historic and allowed me to arrive at a deeper understanding of what history means and how it is defined. To even reach some rough understanding of the distinctions between historic and non-historic would not only be beneficial to city and town planners of today, but to tourists and visitors of tomorrow. For to preserve our heritage is one of the most important tasks left to us, the curators of the present. I believe that in this age, when America’s era of prosperity following WWII is finally becoming historic, we need to make sure that we take measures to ensure that this heritage is not destroyed. Essential to determining this is the distinction between history and non-history and an informed discussion about the future worth of historic buildings. It may seem logical that much or even all will stay, but the truth is that development is inevitable and some things must be destroyed. To determine what is to be destroyed and what is to be preserved requires a strong understanding of what historic means and what makes historic buildings historic. The proper balance between destruction and preservation is difficult to find, and can only be found with a greater understanding of history. Take a moment and imagine a town¾we will call it Townville, Somestate, USA, for the sake of this hypothetical situation. Now imagine that you are the town counselor in charge of development. Imagine further, if you will, that you would like to widen the road through Townville in a project that will drastically limit the commute time of around 300,000 people every day and will very likely bring economic windfalls to your town. Unfortunately, you are faced with a difficult decision: to build this road you will have to demolish one building on the aptly named Road Street. One of these buildings is a fine and well-kept Victorian townhouse. Its state of preservation is good, although there are several like it elsewhere. The next is the oldest building in your town, a rather drab 1700s log cabin that has hosted a small museum (average daily visitation 10 to 15) for the last ten years. Beyond that is a building centrally located in your main street, a rather ugly 1950s construction, but home to a prosperous business, which is something of a local icon. Beyond this (Road Street is rather long) is the old train station, a neo-Romanesque brick structure that currently sits empty, but would be prime real-estate for a neighborhood redevelopment project. Next is the old warehouse, now crumbling, but the location of nationally important labor-strikes in the 1890s. Farther along sits the house (a rather typical house, it must be said) where Human Man (a great hero in those parts, subject of a folk song) died in 1830. The last building you could demolish is a more modern county office building, the most hated building in town because of its brutalist architecture, but having been designed by a renowned architect, a highly innovative and architecturally acclaimed building. This is a true dilemma, for you, rather rationally, have decided that it is best to be on the right side of history by choosing to destroy the least historic building here. But how will you decide? This is the great question facing many towns across many states across America: what is the value of our historic heritage, and what, if anything, does it contribute in a modern world? It is not a question that can be answered easily, and is one which asks many questions on the path to answering it. It is not even a question that has a single or simple answer. The answer to this question, the question of how to find the proper place for our historic heritage in this modern world, is elusive and can be best answered in a series of suggestions than in a single, all-inclusive statement. What should be considered first in deciding whether to preserve a building is determining whether it is historic. The second consideration is deciding whether the preserved building will have any uses. I believe the key to these considerations is uniqueness: the historic building is one that is unique in one or multiple ways, and the best use for an historic building is a use that singularly capitalizes on the uniqueness of the building. To return to be beginning, however, we must ask ourselves what the definition of “historic” is, for before we can even begin to discuss what should be the place of historic buildings in the modern world (i.e. for what uses should these buildings be preserved), it is necessary to establish with some certainty what this term means. Without understanding it, it is further impossible to determine what buildings are historic. And this is not as simple a task as it might first appear, especially when the term is applied to buildings. The dictionary definition (here, the Oxford English Dictionary) is “Famous or important in history, or potentially so,” and even this definition expresses the uncertainty in the term. This uncertainty lies partially in determining whether “historic” refers simply to age or whether it also refers to artistic value and architectural individuality. The uncertainty also lies in determining what we even mean when applying the term at all. In its current usage in legal documents concerning the preservation of old buildings, the term “historic” is used to describe buildings that, in their various historic or architectural significances, have been deemed superior to other buildings. “Historic” buildings are preserved, for the good of the community, as testaments to the past and essential pieces of a communal patrimony. The various laws (local, state, and national) which recognize “historic” buildings range from largely honorary to relatively restrictive. The National Register of Historic Places, for instance, does not impose any zoning requirements on its honorees, except for when they accept government loans for renovation. State and local laws, however, can be much more restrictive, and often they will impose restrictions on the further development of a property to protect its historic nature (Rocchi). There has been some question of how far these restrictions can extend, for instance, whether the property owner must apply for protection to be restricted. The answer, at least in terms of legal precedent, is that historic preservation ordinances can exert a fairly broad control over the development of buildings that fall within their jurisdiction. Such buildings can be protected even if the property owner does not desire it, and this is not considered to be an unjust seizure of property by the government (Penn Central). For the building designated as historic, therefore, this designation will mean increased protection from development and often access to federal and local restauration grants. Legally, the fact that be building is protected by these laws is much more important than whether it is widely considered historic by the general public. Colloquially, historic means something that has contributed to or participated in human history; legally the same word, applied to buildings, refers more directly to something that ought to be preserved, and which has received protections so that it might be better so. This differentiation between the legal meaning and the colloquial meaning makes sense when you stop to consider it. The key is remembering that history, in the colloquial sense, is not a binary system. In everyday conversation, it is not a question of “is it historic or not?”; it is instead a question of “how historic is it?”. Every building, no matter how modern, holds in it a bit of history; any building in a thousand years becomes immensely historic. There is potential in every building to become historic, whether by extreme age, whether by events which take place within its walls, or by fame of its occupiers. However, as it goes, some buildings naturally have a predisposition to become more historic than others. Those with striking or significant architecture, those displaying the best craftsmanship money can buy, those of unique or innovative design are those which will naturally be the best examples in the future of the current architectural designs. These buildings will be the most colloquially “historic” after many years have passed, and they are held up as paragons of the past architectural style. However, although some buildings may be more historic than others, every building is “historic” in the colloquial sense. However, not every building can be preserved. When we search for a definition of historic to define it in a way which will be useful in directing preservation, we are not searching for a way to determine whether a building has or has not played a part in human history (for every building has), but instead a way to distinguish between the parts played by buildings to find those whose contribution is the most significant. What legal definitions of the word “historic” try to do, therefore, is to determine which buildings are important enough that they should be preserved. This is the how the legal meaning of historic¾worthy of preservation for future generations¾is related to the colloquial one. Perhaps this relationship is an obvious one, but I think very often we have a way of compartmentalizing “historic” and “worth preserving” into two different categories. It is not until we sound the depths of “historic” that we discover that in many situations, it really means “that which should be preserved,” as differentiated from the more quotidian history which is common to all things. Moreover, such a definition is very useful in the pursuit of the fundamental question of this thesis: Which buildings should be preserved as historic monuments, and what place ought they to find in the modern world? We will start by examining the many legal definitions currently set forth for historic, in hope that through comparison of these various determinations of what is worthy of preservation, we can both find the current legal consensuses and begin to arrive at our own conclusions about the matter. The comparison of the laws, however, will not lead us to a concrete answer, because as it is, almost every town, city, and municipality which has an historic preservation law defines the term “historic” differently. Let us now examine a few examples of “historic” as defined legally, so that we might compare them and draw conclusions. The definition that is the most important is, without a doubt, the one found in the National Register of Historic Places. The Register defines what is “historic” for buildings throughout the country and was one of the first laws to do so (“The National Register”). A building anywhere in the country may be submitted for recognition on the National Register, a division of the National Park Service. To be recognized, a building must be considered by an arbitrator to fit one or several of the criteria for consideration. They are as follows: The building or property must be “associated with events that have made a significant contribution to the broad patterns of our history”; “associated with the lives of significant persons in our past”; must “embody the distinctive characteristics of a type, period, or method of construction, or that represent the work of a master, or that possess high artistic values”; or must “have yielded or be likely to yield, information important in history or prehistory” (“Criteria”). However, the firmest criterion is the preclusion of any building newer than fifty years, unless it is deemed to be “of exceptional importance.” The specific date given here would seem to set fifty years ago, currently 1968, as the date where buildings turn historic, a notably firm cut-off (“Criteria”). The National Register of Historic Places’ criteria for consideration is not the only code in the United States that defines what is historic, however. Throughout the country, cities, towns, and counties have established architectural review boards, written new codes, and tried to preserve as best they can their own heritages. With such a massive collection of historic preservation codes, almost all of which are different, having been specialized for their own locality, it would have been impossible to review every one. I have, therefore, chosen to strategically choose codes from around the country to represent various views on history. I will start with the 1974 historic preservation code of Charleston, South Carolina, which was the first city in the country to have any protection for its historic buildings, starting with a small historic district and architectural review board with very little power in 1931 (“Old and Historic”). The code from 1974, assembled by a group of experts, contains suggestions about which buildings in the city should be preserved, and is the first document I could find for the city which defined what was considered to be historic, at least in a general sense. It is important to note here that the code of Charleston was very specific¾the city conducted a survey of every single building and passed judgment on them all. It was not like the more passive system of other cities and of the National Register where historic buildings must submit an application to the city to be declared historic. Instead the code judges every building in the city on the quality of its architecture (it does not say historic architecture, but from the buildings rated highly this was clearly the intention), the uniqueness of the building itself, and how well the building contributes to creating an appealing scene. This code, although it does not ever define specifically what is historic, does lay out what its authors considered to be worthy of preservation, which in a way constitutes another definition of historic, albeit a more practically minded one (“Historic Preservation Plan”). The next code I will discuss is a much more recent one for Philadelphia, Pennsylvania. This code was written in 2007, and it gives an example of a modern perspective on historical preservation in cities known for their history (Charleston and Philadelphia are known as some of the finest examples of colonial cities in America, and both were extremely wealthy before the Revolution, contributing to a high quality of architecture). This code approaches the process of historic preservation differently than the Charleston code, opting instead for the National Register’s system of definition and evaluation. Their code, however, has a different definition of what is historic. Among the notable differences are that Philadelphia’s code does not include an age before which a building cannot be declared historic (as opposed to the 50 years specified in the National Register’s definition) and the inclusion in Philadelphia’s code of buildings which show a “significant innovation” in their designs and motifs. This distinction paves the way for inclusion of more modern buildings, because even buildings built quite recently can exhibit significant innovations. In a way it almost seems to be hoping to protect buildings that, due to their innovative construction, are destined to be historic in the future (“City of Philadelphia”). The next city I will examine (and also the last) is Las Vegas, Nevada. I chose Las Vegas because, among major cities in the United States, it is one of the newest. Examining its historic preservation code, therefore, gives a perspective on how the term historic is treated in cities where the city’s history is not so prominent and celebrated. The code itself, modeled on the National Register, is very similar to other historic preservation codes. In fact, their code states outright that any property already on the National Register will be automatically included on their own register of historic places. Consequent to the recentness of their history, however, they will also accept buildings up to forty years old, ten years newer than is allowed by the National Register, and buildings even younger than that if they are important in the community (“HD-O Las Vegas”). With these current definitions of the word “historic” having been examined, it is now possible to compare the definitions. What first becomes clear is that none is the same, and that there is certainly no consensus except for in a couple areas. All the definitions discussed here include the uniqueness and quality of the architecture of a building as significant parts of what make it historic. All the definitions but that one employed in Charleston (which you might recall is slightly different, measuring more what is worthy of preservation as historic rather than what is rudimentarily historic) mention that notably historic activity in a building should make it historic. The codes of all but Charleston also include buildings that yield information important in history, by which is meant, I presume, buildings which have some archeological significance, such as a more modern building built over older foundations or burial grounds. However, despite these similarities, it is important to note the great differences which make coming to any conclusion quite difficult. The main difference concerns the “cut-off date” so-to-speak—the date past which buildings cannot be considered historic. Some definitions, like the National Register, place the date at 50 years; some, like the Las Vegas definition, place the date differently (in this case 40 years); some, like the Philadelphia definition, do not give such a cut-off date at all. This difference may seem trivial, but is important to note that a twenty-year-old building in Philadelphia that pioneered a new architectural style would be easily considered historic, while such a building would be laughed at if submitted to the National Register. Other differences include the substitution of local for national importance in local codes and the obvious differences in structure between the code of Charleston and the other codes we have examined. It is partly due to these differences that it is challenging to draw any broad conclusions from these codes, or to consider any superior to any other. However, I would say the chief weakness of all the definitions is that they lean heavily on such subjective judgments as “possessing high artistic value” and “of exceptional importance,” phrases which can be interpreted differently by different people. I would add further that where the definitions try to be empirical, such as by choosing to have a “cut-off” date, they come by these dates arbitrarily. The National Register itself admits to the dangers of having such a firm cut-off when it adds the caveat “unless of exceptional importance” (Criteria). With this caveat, even the most empirical of the definitions put forth for “historic”¾the straight date definition¾becomes clouded by subjective judgment. It seems to be the case that any definition of historic will be so. In a way, this ambiguity makes sense, for humans are never truly heuristic judges of things. Very often one person will find something beautiful and someone else will not, and, although the concept of history is less nebulous than the concept of beauty, the case can be the same with buildings and history. Take for example the architectural style of brutalism. It is perhaps the most divisive architectural style in recent history, having proliferated in the 1960-70s due to the cheapness of the main material, concrete, and having just as quickly attracted a large cohort of detractors. Now some argue that the style is coming of age and should be protected as historic (Hay), while others maintain that it remains nothing more than an eyesore (Charles). Such it is with many buildings and styles: what may be considered “of high artistic value” or “of exceptional importance” by some, may not be considered so by others. If we set out to arrive at any universal definition of “historic,” we should by now have realized that such an ambition is a quixotic dream, since everyone is able to interpret these subjective criteria, on which all definitions of historic are based, differently. There is, however, hope that these subjective criteria might be interpreted consistently enough that they could produce a fairly firm definition, unaffected by the capricious whims of individual reviewers. I received some valuable information on the actual review process (by which each building is checked against these criteria for compliance) by interviewing Patrick Andrus, who works for the National Register of Historic Places and who reviews applications daily. When I asked him about how one judges what is of “high artistic value” he responded that it “is an aesthetic judgment that must be grounded in a thorough understanding of the appropriate architectural style and the architect's entire body of work, after comparison with of other architect's works of a similar nature.” He continued by stating that “it should be based upon a widespread and scholarly recognition that, within the historic context with which the property is associated, the building is an exceptional example of its style, period, or method of construction.” And although this is still an arbitrary judgment of sorts, favoring the opinions of the scholarly community, it seems likely that these judgments are at least consistent, and are quite likely judgments that everyone can agree with. Such a consistent judgment gives good foundation to a formal definition of “historic” relying not on empirical measurements, such as age, but instead on less specific criteria such as uniqueness, artistic value, and relation to “significant” events in history. Admittedly, it would be preferable, from a stand point of comparison and consistency, to have a simple formula, which could be applied using solely empirical measurements, to determine whether a building is historic. As has been demonstrated, however, this is not possible and is, perhaps, not even desirable, because the essential decision of whether a building is historic is a specialized decision, considering the specific circumstances of a building. Such a complicated and multivariable decision is not one which is easily made with hard and fast rules, but through individual consideration. In summary, an historic building, or a building that should be preserved, can generally be defined with some certainty. The most basic feature of an historic building that is common to all the definitions seems to be its certain uniqueness, whether because of age, because of architecture, because of use, because of association, because of construction, because of decoration, or because of anything else. In truth, I think that almost every consideration which can lead to judgment as historic is ultimately based on uniqueness. High quality architecturally can be discussed in terms of uniqueness. Association with an historic event or person can be described in terms of uniqueness. Being innovative in a design that is then widely adopted, can still be described in terms of uniqueness. And although the degree of uniqueness must ultimately be judged by the organization which desires to define historic, and although because of this judgment a definition of historic by uniqueness will never be entirely empirical, I still believe it is the best and simplest system of judgment, specifically since all the existing codes essentially boil down to this one chief tenant. I further maintain that this definition will only be useful if it is approached, as Patrick Andrus suggests, with appropriate understanding of the background to be able to decide what is unique. Having now decided what should be preserved¾that which is unique¾the conversation must now shift to the second side of the consideration: For what do we preserve these buildings for in the first place? This is the logical step, not only because I stated so in my thesis, but because considering historic preservation without considering the destiny of the historic buildings is like hoarding bees without ever thinking about harvesting honey from them. It would be a completely illogical pursuit. We must therefore consider, when we consider why a building should be preserved, what we will do with the building once it has been protected, because if the building will have no use and will be enjoyed by none, then its preservation is not worth the trouble it will cause preserving it. The question therefore we will strive to answer is: What uses can an historic building find in a modern world? And are all these uses really useful? It seems only natural to commence this discussion with a healthy dose of anecdotal evidence, showing the current employment of several historic buildings (or groups of buildings), before we launch into the analytical conclusion and philosophical discussion that might lead us to determine what uses are the best for these buildings. I will start with examining the case of the Old Post Office in Washington DC (see fig. 1). 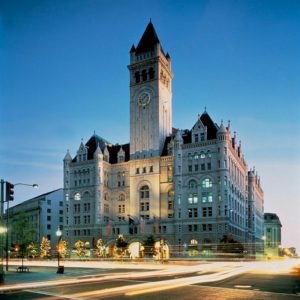 This building is considered by many to be one of the most impressive buildings ever built in Washington, a large, ornate Richardsonian Romanesque edifice with a large clock tower. It also has a large interior hall, nine stories high. It was built to house the post office of the growing city along with the offices of the National Postal Service. However, by the time it was constructed, it was already too small for its intended purpose, and the building ceased to be used as the post office just ten years after it was constructed. The postal service outgrew the building within thirty years. To add to the apparent uselessness of the building, its architectural style turned out to be a rather short lived fad and was soon eclipsed by the neo-Classical style for federal architecture, leaving the building looking distinctly out of date. In fact, the building was constantly “next to be demolished” from the time before the Great Depression to when it was inscribed on the National Register of Historic places in 1973. Throughout this time, it was mainly the cost of demolition that saved the building from being scraped. 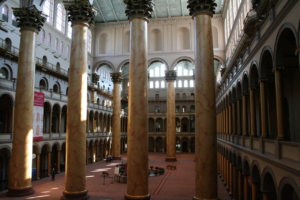 However, as the years went on it was increasingly regarded as a DC icon and a masterpiece of historic architecture. The first repurposing after the building was saved from destruction was as a mixed-use building, with shops and restaurants in the large interior hall, and federal office spaces on the floors above. The clock tower was opened as an observation deck, operated by the National Park Service (Shultz). Although it appeared that the building, which had struggled since its very construction to find its place, had finally succeeded, the shops and restaurants did not receive much business (the foot traffic was not there—the building is located directly in the center of the federal offices in DC). Soon, in 2011, the government was searching to redevelop the building again. The property continued to attract interested developers, with ten companies bidding for a lease of the building. Ultimately Trump International bought the building in a high profile bid to make the building the preeminent hotel in DC. The museum in the tower remains open. It is yet to be seen how successful this endeavor will be (Mayer). Another large building with a distinctive architectural style that has found a new use after originally being designed to house governmental offices is the former Pension Office. Constructed to house the newly founded pension office after the civil war, the building was considered by its architect, Montgomery Miegs (the same man who designed the Capitol Dome), his greatest accomplishment. Designed after motifs found in architecture from the Italian Renaissance, the building incorporated an innovative ventilation system and one of the largest interior lobbies in the city (see fig. 2). The building is also of note for the frieze around the outside that celebrates the heroism of Union soldiers in the Civil War. Used for federal offices until the 1950s, the building sat vacant for a number of years, before being placed on the National Register. In 1980 the Congress approved a plan to make the building the home of a museum about architecture and design, a Museum that remains in the building to this day. Beyond this use, the Pension Building is also the sight of many large gatherings in DC, such as presidential balls, award ceremonies, and political rallies, due to the large size of its interior hall (“The Pension Building”). The next building I will examine is very different from the two examples I have just discussed, and represents, in my opinion, a most creative reuse of historic heritage. This is the case of the Bethlehem Steel Blast Furnaces in Bethlehem, Pennsylvania. These blast furnaces, 230 feet tall, complicated, industrial, and rusting phantoms of the city’s industrial past since they were abandoned in 1995, are, while not the most attractive buildings ever constructed, immensely historic, both as the center of the community for over 100 years and as the center of steel production in the United States for a good portion of that time. The furnaces provided steel for constructions ranging from the Chrysler Building to the Golden Gate Bridge. When they were abandoned by the Bethlehem Steel Company, the community scrambled to preserve them, both to preserve what was so important in their community and to preserve the unique factory complex, which was constructed starting in 1915. The problem, of course, was how to use a large, rusting factory, and how to pay for its upkeep. The solution the Bethlehemites decided on was to convert the giant steel factory to a public performing arts venue, using the blast furnaces as a central feature. This project, although it was only completed recently (2010) seems to have been a great success (“What is Steelstacks”). Other uses for buildings can include simply acting as part of a main street, being a part of an historic residential neighborhood, or even, if possible, being employed in its original function. It must be remembered that for many buildings this will be the best option for preservation, because there is always demand for historic main streets (think York, Pennsylvania; Galena, Illinois; Port Townsend, Washington, etc.) (Curtis) and historic residential communities (think Beacon Hill, Boston; Georgetown, DC; Old City, Philadelphia, etc.) (Gentil). These communities are not historic if they are not comprised of historic buildings, and simply contributing to an historic atmosphere is also a perfectly acceptable use for an historic building. In the same way, using an historic bank building as a bank or an historic town hall as a town hall is also a perfectly acceptable (in fact preferred) use for an historic building. If the building continues to be able to serve its original purpose and that purpose still exists then there is no need to search for an alternate usage after preservation—the usage is already there. At this point readers may be feeling incredibly sanguine about the prospects for historic buildings: they may have the impression that, whatever the building, it has a natural and desirable use. Unfortunately there are many cases where a building is preserved only to waste away, lacking any purpose that would keep it in good upkeep. There are far too many cases where buildings sit for years locked up while the owner searches in vain for someone who will develop it. These cases of failure are much more difficult to find, because nobody celebrates them, but I have one example, which I encountered while skimming through my local news. The John Mosby House in Warrenton, Virginia, was the home for only seven years of John Mosby, a Civil War general from the Confederacy, but its connection to the locally famous Virginian led the town of Warrenton to buy it in 1999 in order to restore it and open it as a tourist attraction. The undertaking was expensive, costing well over a million dollars, only $800,000 of which were provided through grants. The house was opened as a museum for only a year before funding ran out, and the endeavor was not making sufficient money to stay open on its own merits. The town of Warrenton is now attempting to sell the building again, but nobody seems willing to pay the 500,000 dollars the town is asking. This is an example of how historic preservationists can sometimes be overly excited about a project, for although the building was worth preserving, the use they planned for it was not studied well enough in advance for them to realize that there was simply not demand for the house museum they were envisioning. Many historic buildings in America today face this dilemma: they are simply not drawing the crowds in sufficient numbers to make it a viable option to run them as museums (Palermo). Stopping here to consider quickly the uses that buildings can have while being preserved, we can make a few definite observations. Firstly, there are many different needs an historic building can fill, and they are readily adaptable for many uses. Second, this does not prevent buildings from having few to no practical uses when preserved. Third, it should be encouraged that historic buildings attempt to continue to serve the function they were designed to serve, because this will naturally be the use the building was designed for. It is important to note that the more unique the adaptation of the building is, the more successful it will tend to be. When the Old Post Office in DC was originally turned into a sort of mall, the building did not thrive, because there are malls a-plenty without this new one, and additionally the mall did not utilize the natural advantages of the building to the fullest. The tower museum, however, which was unique in DC for its views (second best only to the Washington Monument) and emphasized the uniqueness of the building was much more successful. The same can be said for other buildings—the more unique the use and the more that uniqueness plays off the uniqueness inherent in an historic building, the more successful the use will be. I think therefore a satisfactory conclusion to the question of what should be done with historic buildings is that they should all be kept in active use. Whatever that use is does not matter exactly, although I believe the best uses are those uses which are unique and capitalize on the eccentricities of each building. It is essential to remember that less exalted uses such as residential or business use are perfectly acceptable. Having determined what makes a building historic (or worth preserving) and what uses are proper for old and historic buildings in the modern world, I think I may properly return to the position I held at the beginning of the paper and explain it farther. I believe you can see now my argument for uniqueness laid out on two fronts. What I did not elaborate on for general cases, and will not because I believe it is something that should be decided on a situational basis, is how these two considerations should be weighed (by that I mean which should be valued more if one speaks in favor of preservation and the other speaks against it). I believe that whether the organizational body deciding on the preservation of certain buildings is more focused on preserving their most historic buildings or on their most adaptable buildings should depend on the situation in which the organizational body finds itself. For instance, if the organizational body is focused on redevelopment, it seems natural to me that they would focus more on the buildings that are most adaptable to preserve; if the organizational body is focused on preserving the historic character of an area, than naturally they should focus their efforts on the buildings that are the most historic. Ideally they would not have to choose between buildings that they would like to preserve; ideally all buildings the organizational body would like to preserve are both extremely historic and eminently adaptable. But the reality is that not every building can be preserved; the reality is that not every building is on the same caliber historically as Independence Hall or the Pension Building. Towns, cities, counties, and countries are very often faced with hard decisions concerning historic preservation. The reason that they should look not only at the historic nature of the building but also at the possibilities it has for reuse is that the historic building which serves no use is not only unable to maintain itself, but will also sit, often derelict, not as a testament to history so much as to the fact that glory always fades. The unused historic building has all the problems of preservation without the benefits. It is very hard to swallow the fact that sometimes historic buildings must be destroyed, especially if they will have no function but to be historic. If we can settle on these considerations, if we can accept that the building that should be preserved is the building both historic and easily adaptable and that both these can be determined by examining the uniqueness of the given building or the given adaptation, then we can at last return to the hypothetical town presented in the introduction, where you, the hypothetical town planner, were being asked to make an incredibly difficult decision, and decide which building is to be destroyed. Is it to be the Brutalist office building (still usable), acclaimed for its architecture by architects, but hated by the average pundit? Is it to be the home associated with the death of that great hero, Human Man? Or shall it be the warehouse, which, although now largely ruined, was the site of nationally important labor strikes? Shall it be the train station, which currently serves no purpose (but could if it were repurposed)? Or maybe the ugly and workaday 1950s building that is nonetheless a local icon because of the venerable institution (a local icon, you will remember), which still inhabits it? Or perhaps you will condemn the small log cabin, which is the oldest building in your town but does little anymore but host a small museum, which posts more often in the red than the black? Or maybe it will be the Victorian manse, well preserved and quite pleasing but also very similar to hundreds, nay thousands of other buildings across the country. The choice is yours. It is not easy, but I hope now at least you can evaluate a little more clearly than you could before why each building was chosen for a place in Townville, USA. They are each emblematic of preservation challenges across the country, those buildings which are historic but not useable, or useable but less historic. So, make your choice. I only warn you, that no matter what you do, even if it be the right decision, someone else will contest it to the bitter end. Andrus, Patrick. “Re: A Question from a Student.” Re: A Question from a Student, 24 Jan. 2018. N.d. Web. 30 September 2017.
of British Architects.” Web. 30 September 2017. Places, N.d. Web. 9 September 2017. Curtis, Wayne. “America's Greatest Main Streets.” Travel + Leisure, 17 Apr. 2012. Web. 21 March 2018. Gentile, Jay. “The Most Beautiful Historic Neighborhoods in America.” Thrillist, Thrillist, 18 Mar. 2016. Web. 21 March 2018. Hay, David. “Defending Brutalism.” National Trust for Historic Preservation, 1 January 2013. HD-O Las Vegas. City of Las Vegas, Nevada, N.d. Web. 30 September 2017. “Historic.” Oxford English Dictionary. Web. 30 September 2017. N.d. Web. 30 October 2017. May 2014. Web. 23 February 2018. National Building Museum interior in Washington, DC, 10 October 2010. Photograph. Wikipedia Commons. 25 March 2018. Preservation Archive Project. N.d. Web. 22 February 2018. Times, 8 Aug. 2017. Web. 23 February 2018. Information Institute Cornell Law School. Web. 16 May 2018. Shultz, Scott G. “America's Watchtower: Saving the Old Post Office.” CRM, 1998. Web. 30 September 2017. “The National Register of Historical Places.” The National Register of Historical Places.com, N.d. Web. 21 March 2018. National Park Service, N.d. Web. 23 February 2018. “What Is SteelStacks?” SteelStacks, SteelStacks. N.d. Web. 23 February 2018.